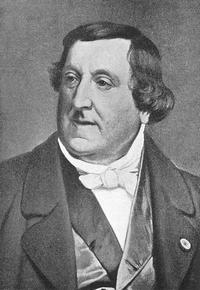 Gioachino Rossini was born into a family of musicians. He studied in the Conservatorio of Bologna. In 1810 at the age of 18 he produced his first opera. In 1813 he created Tancredi which had an enormous success. In 1815 he wrote Elisabetta, regina d'Inghilterra, a first of a long serie of operas in which Isabella Colbran, who subsequently became the composer’s wife, played the leading role. His immortal Barber of Seville was created in 1816, he second masterpiece La Cenerentola in 1817. In 1824 at the age of 32, after spending time in London and Paris, Rossini was able to go into semi-retirement with essentially financial independence. The production of his Guillaume Tell in 1829 brought his career as a writer of opera to a close. As of 1932 till his death in 1868 at the age of 76 he was no longer active as a composer.